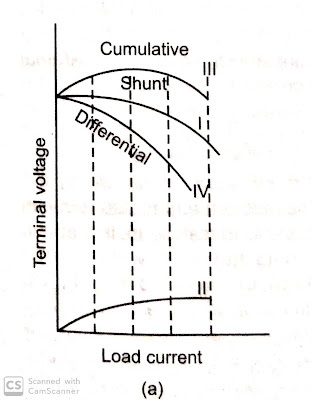 The characteristics curves drawn between the load current and terminal voltage are shown in figure 27 (a).The support that curve (I) represent the voltage characteristics due to stunt winding at one end, curve (II) represent that due to shunt winding alone. 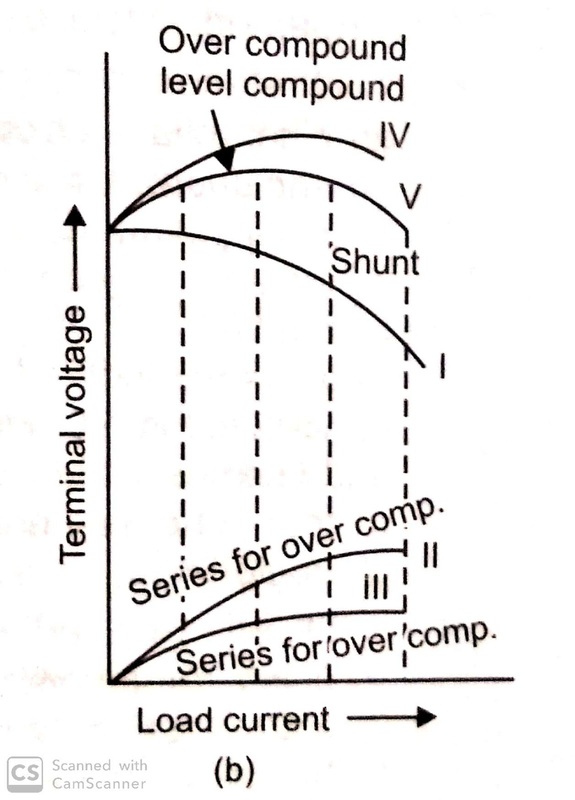 When both the series and shunt windings are connected in cumulative design, then curve (III) represent the resultant voltage characteristics. 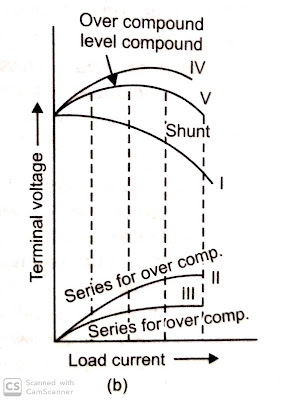 Similarly, curve (IV) represents the resultant voltage characteristics for the differential design of series and shunt windings, as shown in figure 27(a). If the fall in voltage between no load and full load due to shunt field alone is exactly equal to the rise due to the series field, then the terminal voltage will be stable and the generator will be known as a level compound generator. The curve (V) of figure 27 (b) shows the resultant characteristics of a level compound generator. 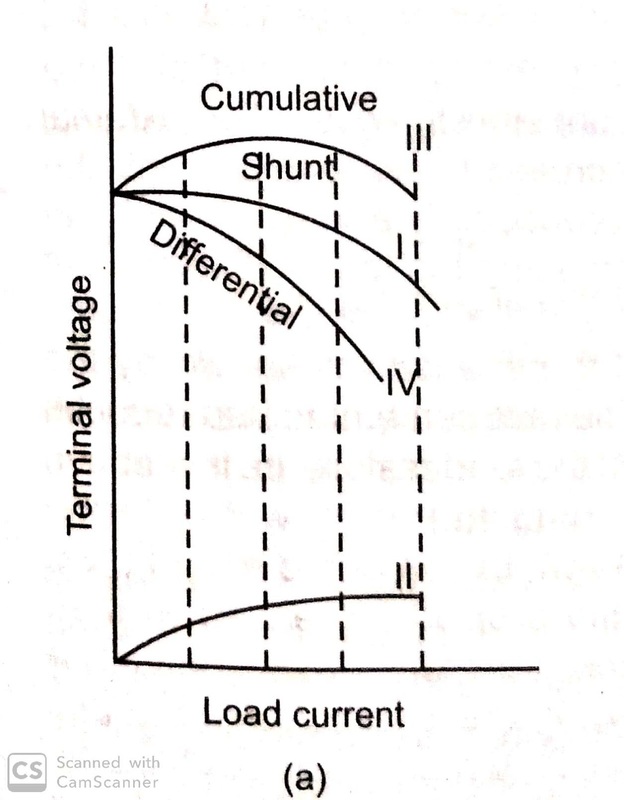 Over compound generator- If the series field is made to give a voltage on full load which is greater than the fall due to shunt field then the terminal voltage will be of gradually increasing nature, As shown by curve V in figure 27 (b). In this condition, The generator will be known as over compound generator. A shunt generator of 30 ohms resistance gives a current of 5 amperes. If the field resistance is 150 ohms and armature resistance is 2 ohms, then calculate the emf induced. Hence, induced e.m.f. E = V + Ia . Ra = 150 + 12 = 162 Volts. › The residual magnetism has finished. › The polarity of residual magnetism is reversed. › Field winding connection is reversed. › The resistance of the shunt field is higher than its critical value. › The resistance of the load circuit is higher than its critical value. › Field winding connections are reversed. › The circuit resistance is higher than its critical value.